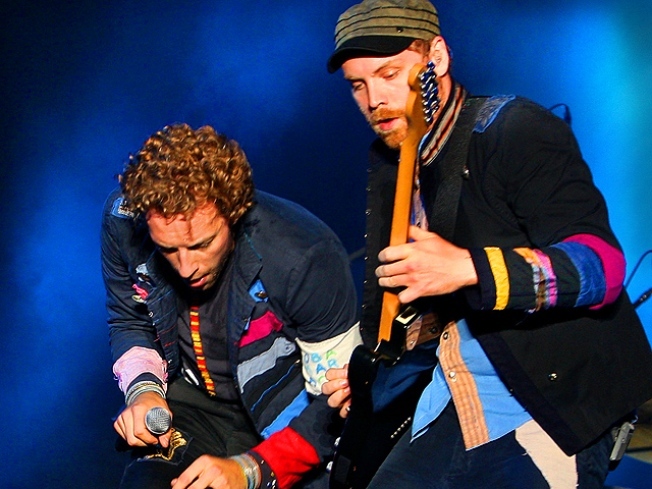 Chris Martin and Jonny Buckland of Coldplay perform at 2009's All Points West Music & Arts Festival at Liberty State Park across from New York City. The final day of the All Points West festival pulled through some organizational glitches and spotty weather to wrap up an enjoyable and memorable event. For whatever reason, festivalgoers were held at the entrance until 4 pm - despite the advertised noon entry time - which nearly erupted in mud-slinging chaos. This also meant that the scheduled 4 hours of stand-up comedy were condensed into 50 minutes which seemed to intimidate comics Todd Barry and Janeane Garofalo who largely bombed in a blaze of pity chuckles and eye-rolling silence. Pop duo MGMT lacked charisma and flatly delivered typically sunny jams like “Time To Pretend,” and “Electric Feel.” However, the group slightly redeemed themselves by breaking fans off with the title track from their upcoming album, Congratulations. In the end, sensitive rockers Coldplay owned the night. The band kept their catalog of gentle mega-hits like “Clocks,” “Viva La Vida,” “The Scientist,” and “Fix You” engaging with ethereal lighting design and Chris Martin's cheeky musings about the weather. Playful interactive touches like yellow balloons that showered the crowd with glitter when popped and freewheeling sing-a-longs diffused their dramatic repertoire. We'll just say it: the show was magical, dang it. And an awesome send-off to a pretty far-out festival.